We're delighted you're considering our city for your next convention, conference or sporting event. 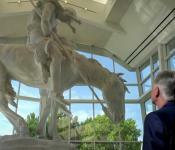 If you've never been to Oklahoma City, you may be surprised by all we have to offer. And if it's been a few years since your last visit, we know you'll be amazed by our progress. Let Wes Chancey stand as testimonial to what we have to offer you in OKC.